It’s no surprise that plenty of people watch the Super Bowl just for the spectacle. And part of the spectacle are the ads. Commercials airing during game time are as dissected the next day as the game itself. Among the ads gathering praise in the Monday morning quarterbacking is one by Norwalk-based startup Bon & Viv Spiked Seltzer. 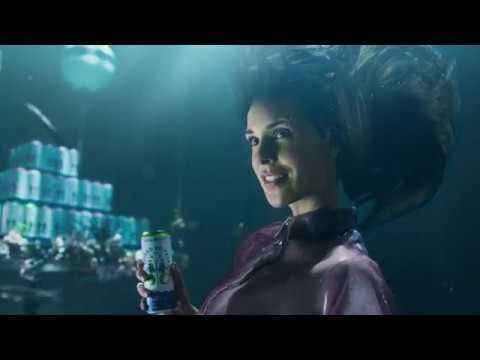 Developed by Bullish, a New York City-based marketing agency, the ad features two mermaids, Bonnie and Vivian, pitching their idea of spiked seltzer to actual sharks and winning them over as investors a la ABC’s hit show Shark Tank . Dan Laustsen, an award-winning director of photography who worked on the Oscars’ Best Picture of 2018 "The Shape of Water," shot the commercial. Looking to create a new kind of beverage by combining disciplines of brewing, winemaking and natural flavors, Nick Shields, a fifth-generation brewer now based in Norwalk, hit upon Spiked Seltzer in 2012. Shields’ great-great-grandfather began the Haffenreffer Brewery in Boston in 1870 and it still manufactures Haffenreffer Private Stock, a malt liquor. Anheuser-Busch InBev bought Spiked Seltzer in 2016, and, with its commercial last night, introduced the re-branded company as Bon & Viv Spiked Seltzer (name derived from the French bon vivant , meaning a person of refined and discerning tastes) featuring new flavors and a lower-calorie, 0-sugar product. The Super Bowl debut, however, will not come cheap. It’s said CBS charged an average of $5.25 million for a 30-second spot during Sunday's game. For more information, visit Bon & Viv Spiked Seltzer .